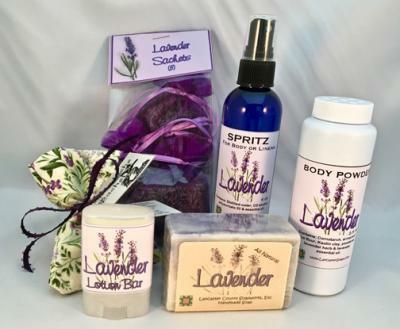 Since lavender is such a popular scent, we have created many lavender products. Creamy white soap, marbled with lavender blue. Loaded with the essential oil of lavender. Our most popular soap. Spritz for body or linens. A great way to scent bed linens - especially nice on pillow cases. A solid lotion bar scented with pure lavender essential oil. While this is a nice moisturizer, it can also be used as a solid perfume. Delightfully fragrant powder made with arrowroot, cornstarch, rice flour, kaolin clay, powdered lavender, and lavender essential oil. Silky and soothing - no talc. Shake a little on and be transported to the fields of Provence! Three gossamer organza bags filled with fresh, fragrant lavender buds. The scent will last until they have turned to dust - just give the bag a slight squeeze to release the fragrance. They are lovely as sachets in drawers or suitcases, a bedside sleep aid or just a pleasant take along for a relaxing sniff from time to time.